With a color rendering index of Ra>80, color temperatures of 3000k, 4000k, 5000k and 6000k, and low UGR, it could meet environmental requirements and comply with funding guidelines for energy-efficient building and lighting solutions. For special applications where require high accuracy of color, such as in museum, jewelry store, pring factory and so on. CRI 95 linear series is highly recommended. 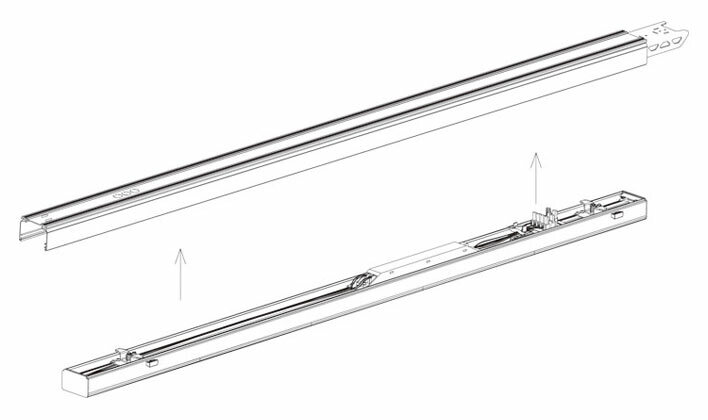 The LED linear lighting system is an energy-efficient , low maintenance better alternative to traditional linear fluorescent in a variety of industrial, commercial and light assembly applications. It is the optimal solution for conventional lighting systems and also excellent for new installations. Due to it's low installation cost, everything in one box and installtion is tool-less. It saves both time and costs when installing lighting systems. Also the LED linear lighting system is really good in terms of the low mantenance. That's typical for LED lighting and this also keep costs low. 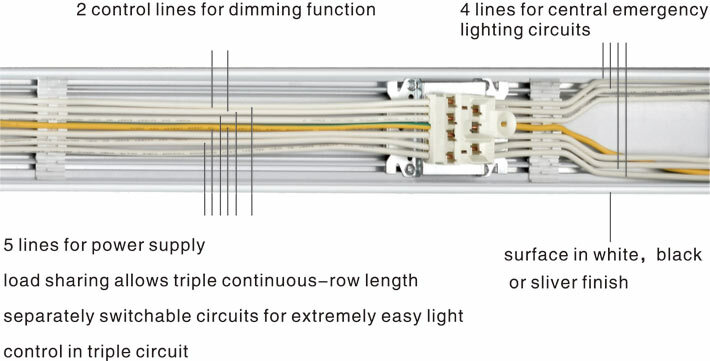 The flexible trunking system for lighting demands in all application, with full compatible modular kit, it adapts individually to complex lightingtasks. It has an 11-pole current conducting section built into its trunking. This means that the system comes ready equipped to meet tomorrow's needs. ll functions such as power suply, lighting control and connection to emergency lighting are seamlessly integrated into this multifunctional trunking. Luminaires can be positioned flexibly and the system can be adapted to suit structural alterations at any time. 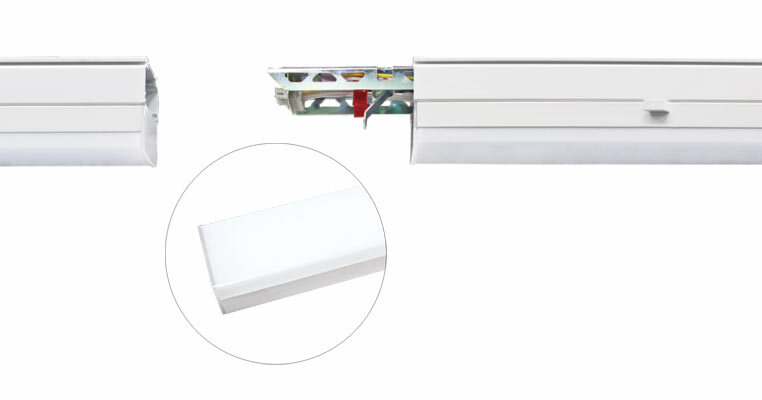 The trunking rail is simply a matter of replacing or adding lighting modulars, light sources or optics as required. A pre-wired 3-phases & 2.5 mm power suply. Phase conversion function with connector. Allow Max 16A and 200 meters trunking length in 3-phases power supply system. Each node connector has diverse of electrical feed-in and feed-out. The node connector is not only to connection the cross trunking, but also to connect the wire inside the trunking. And the node connector itself could even be the electricity feed-in point. Different diffuser for different distribution. A wide range of optics from sharp to wid distribution, as well as asymmetric. Efficient tools for lighting are the basis for solution with low operating overheads and high quality of light. Supplemented with suitable light control savings potential can be further significantly increased. The right type of light management depends decisively on the specific building conditions and usage of the area. With a wide variety of dimming light control systems with suitable sensor technology, and thanks to open, non-proprietary standards, such solutions can be simply integrated into common building management systems. Emergency lighting systems ensure optimum lighting and orientation, even in the event of a power failure. General lighting and emergency lighting are combined in a single highly functional, integrative lighting solution. A wide variety of emergency mode ia available. EL1 EN1 & EL2 EN2 makesmode selected. Ni-MH battery we used is high temperature resistant to make sure its life time could be longer than others. A small spot light is available on 600mm moduleas an extra version featuring a rotating lighting head for emergency use of 5W. Multi-sensor system combines energy saving with highly convenience for user. Most energy can be saved by integrating motion and daylight sensor. Group control sensor or broadcast control sensor is available under a defined period of time. Protect against a solid object such as a wire and protected against the ingress dust. Protected against splashing water from any direct. A maximum suspension span of 3m ensures quick and easy installation with fewer suspension points. Ceiling mounted ,wall mounted and pendant mounted all available. Surface mounted, chain suspension and wire suspension all available.